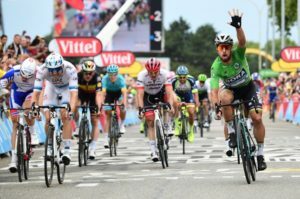 Peter Sagan claimed his eleventh stage win at the Tour de France, the third one in the 2018 event, as he outsprinted Alexander Kristoff and Arnaud Démare in Valence. It was a transition stage for race leader Geraint Thomas between the Alps and the uphill finish in Mende which takes place tomorrow. Geraint Thomas, Team Sky, still holds the Yellow Jersey. As they approached the finish, teams LottoNL-Jumbo, Trek-Segafredo and Bora-Hansgrohe seized the reins of the peloton in the streets of Valence. Groupama-FDJ moved to the front with 1 km to go. Without Fernando Gaviria, Philippe Gilbert (Quick Step) tried his luck by himself. Groupama-FDJ brought him back to give Arnaud Démare a good lead out but the Frenchman was overtaken by Sagan (Bora-Hansgrohe) and Alexander Kristoff (UAE Team Emirates). The Slovakian scored his third stage win at the Tour this year, equalling his all-time record. 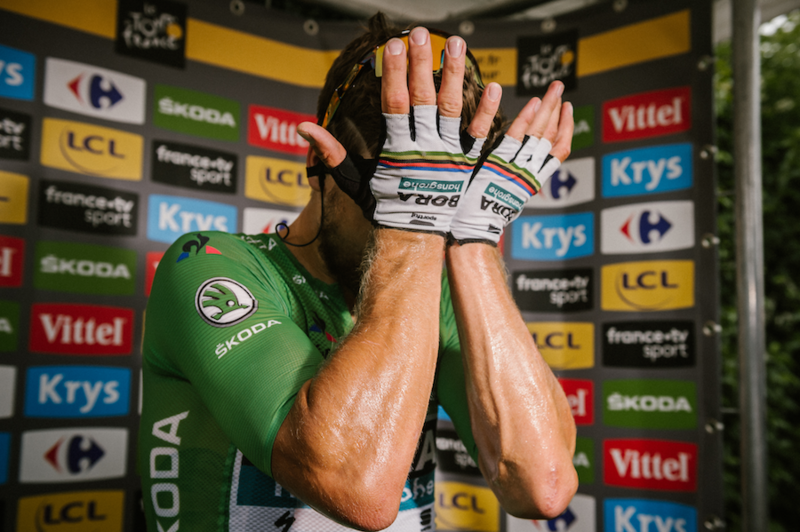 It’s his 42nd stage podium, just as many as Gustave Garrigou, Francis Pélissier and Sean Kelly. Vincenzo Nibali (Bahrain-Merida) was a non-starter due to a broken vertebrae in yesterday’s crash 4 km before the finish at Alpe d’Huez. Thomas De Gendt (Lotto-Soudal) and Tom Scully (Education First) rode away from the peloton at km 2. Michael Schär (BMC) and Dimitri Claeys (Cofidis) rejoined them at km 29 whereas all other counter attackers were brought back by the pack. Their maximum advantage was 3’30’’ before the côte de Brié at km 30. De Gendt took 2 KOM points. 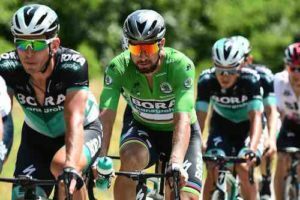 Bora-Hansgrohe, Groupama-FDJ and UAE Team Emirates worked together at the head of the peloton to maintain a steady gap around two minutes. Lukas Pöstlberger, Tobias Ludvigsson and Darwin Atapuma were their respective riders designated for pulling. 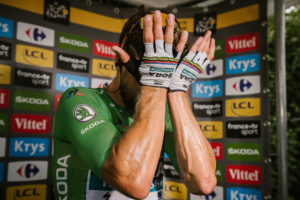 The advantage of the leading four was reduced to 55’’ with 55 km to go, 5 km after Scully crested the category 4 côte de Sainte-Eulalie-en-Royans. The peloton strategically didn’t bring the breakaway back too early. The gap was 30’’ with 30 km to go. De Gendt who won his tenth intermediate sprint of the Tour de France at Saint-Quentin-sur-Isère (km 71) was first to sit up. Schär kept on by himself with 23 km remaining. The Swiss rider was awarded most combative rider of the day, but surrendered 6 km before the line.